The group participation report is supposed to display pages shared with the group and created within a group. However, it only displays pages when they are not in a collection. As soon as they are in a collection, they are not displayed. The report should be altered to show "portfolios" shared or created within the group, i.e. individual pages when they are not in a collection and a collection (with the number of pages in parentheses) when there is a collection. For collections, the comment count should be across all pages that are in the collection. Bug description: Participation report doesn't show pages in a collection. 1. Normal users ‘User one’,‘User two’ & ‘User three’ should exist. 2. Pages ‘Page 01’, ‘Page 02’ & ‘Page 03’ should exist and ‘User one ‘ is the owner of these pages. 4. A group ‘Group one’ should exist and pages ‘Group page01’ and ‘Group page02’ are the pages created within the group. 5. ‘User one’ and ‘User two’ are members of ‘Group one’ and ‘User three’ is not a member. 6. ‘Collection one’ and 'Page 03' shared with ‘Group one’. 7. Comments for ‘Page 01’, ‘Page 02’ & ‘Page 03’ should exist and should have each comment from ‘User one’, ‘User two’ & ‘User three’. 8. Comments for group pages should exist. 2. Navigate to Main menu > Groups. 3. Click the ‘Settings’ button on the group ‘Group one’. 4. Switch ‘Participation report ‘ to ‘Yes’. 5. Click the ‘Save group’ button. 6. Click the ‘Report’ tab. 1. All the pages shared with the Group should be displayed. 2. The pages in the ‘Collection one’ and 'Page 03'should be displayed. 3. Members involved in the group and their comments should be displayed. 4. Non-members involved and their comments should be displayed. 5. Group pages should be displayed. 6. Members involved in the group and their comments should be displayed. Some issues in patchset 6 that will need fixing. See the code review system for comments. 1. Normal users ‘User one’,‘User two’ and ‘User three’ should exist. 2. Pages ‘Page 01’, ‘Page 02’, ‘Page 03’ and ‘Page 04’ should exist and ‘User one‘ is the owner of these pages. 4. ‘User one’ and ‘User two’ are members of ‘Group one’ and ‘User three’ is not a member. ’User one’ is the group admin. ‘Group page 01’, ‘Group page 02’, ‘Group page 03’ and ‘Group page 04’. 6. 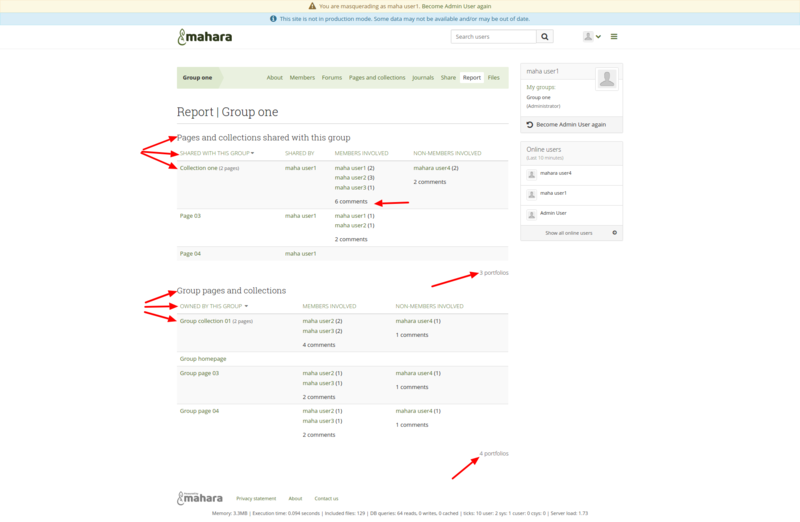 A collection exists with the title 'Group collection one' and pages within the collection are 'Group page 01' and 'Group page 02'. 7. Pages and collection at precondition 2 and 3 are shared with the group ‘Group one’. 8. 'User one', 'User two', and 'User three' should have each commented on 'Page 01', 'Page 02', 'Page 03', and 'Page 04' at least once. 9. 'User one', 'User two', and 'User three' should have each commented on 'Group page 01', 'Group page 02', 'Group page 03', and 'Group page 04' at least once. 1. The page title is 'Pages and collections shared with this group'. 2. The heading of the first table is 'Shared with this group'. 3. The heading of the second table is 'Owned by this group'. 4. The collection ‘Collection one’ and the pages 'Page 03', 'Page 04' should be displayed under the table heading 'Shared with this group'. 5. 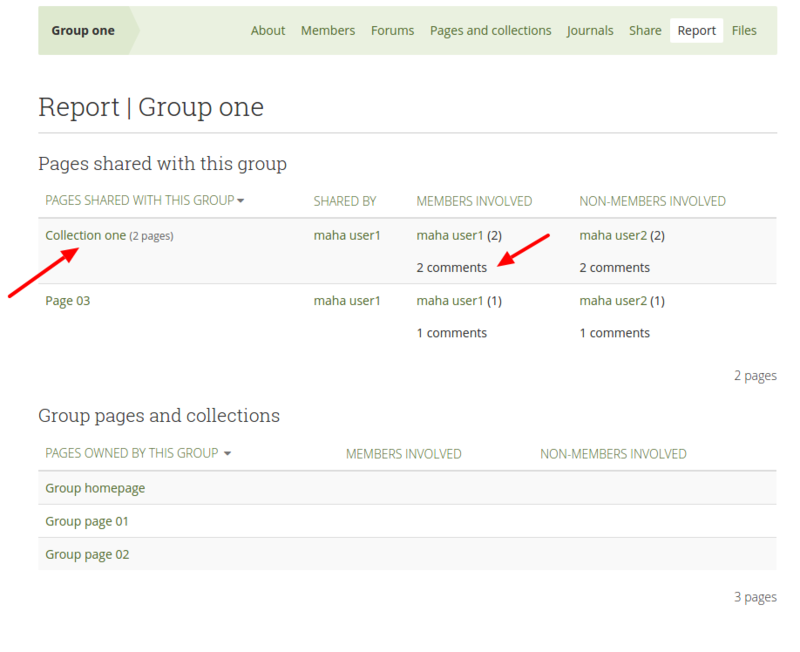 Members involved in the group and the number of their comments should be displayed under the column heading ‘Members involved’. 6. Non-members involved and the number of their comments should be displayed under the column heading ‘Non-members involved’. 7. The group collection 'Group collection one' and the group pages ‘Group page 03’, Group page 04' should be displayed under the heading 'Owned by this group'. 8. 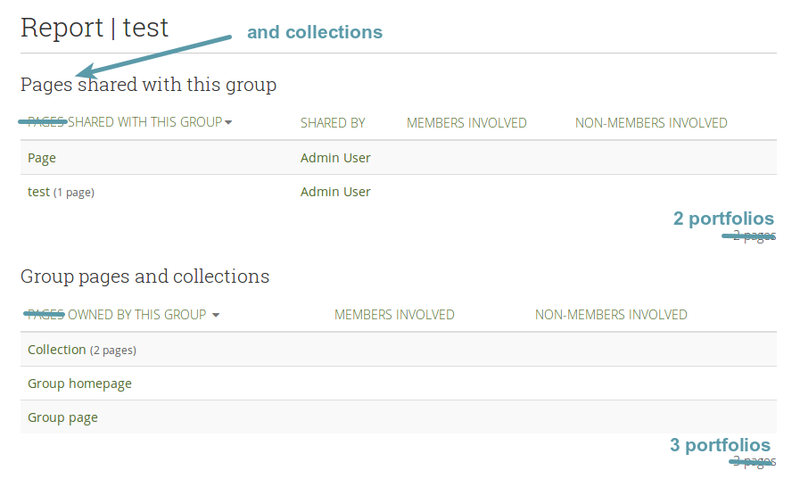 Members involved in the group and the number of their comments should be displayed under the column heading ‘Members involved' for the table heading ‘Owned by this group'.